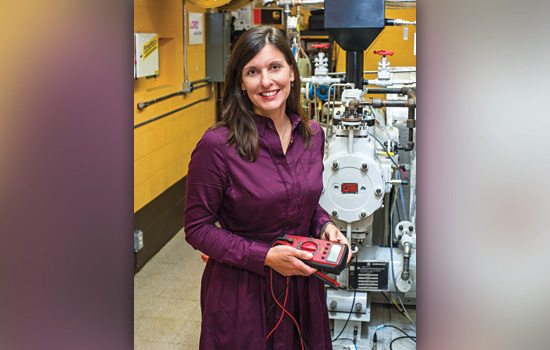 Margaret Bailey holds a voltage meter in a mechanical engineering lab. Margaret Bailey is the principal investigator of a $3.2 million grant from the National Science Foundation ADVANCE program for a project intended to increase representation and advancement of women in academic science, technology, engineering and mathematics at RIT. The professor of mechanical engineering in the Kate Gleason College of Engineering also is the founding member of the women in engineering program, WE@RIT. Bailey came to RIT after teaching at the U.S. Military Academy, West Point. Here, she talks about her background, her interest in gender equity issues and her research. I loved listening to Mike Brady on the Brady Bunch talk about architecture. I just thought that was the coolest thing. I had a friend who was a few years older than me who had gone to Penn State and majored in architecture. He came back over a summer and he told me to consider majoring in architectural engineering rather than architecture. It sounded like a good match. In architectural engineering at Penn State, they only admitted about 90 students a year. Out of the 90, maybe there were seven women. I didn’t see myself in my faculty. I think I had over my five years less than a handful of women. Never were there ever any women in engineering, or physics, or math. It didn’t make sense. I worked as a facilities engineer for about five years before I decided I really wanted to go back and get my Ph.D. I started off at Penn State. My old program had started a Ph.D. program and I would have been the first student to get a Ph.D. in that program. My husband and I wanted to start a family so I got pregnant. Being a female engineering Ph.D. student, the first Ph.D. student in a program, and then you are female and pregnant put a strain on the relationship I had with my adviser. Ph.D. students and babies—we are getting better at it now but 15, 20 years ago it was rough. I spent a lot of time doing research on what other programs were doing and I found the University of Colorado at Boulder. I finished up grad school there. There were many grad students who had families. There were women. One of the guys I went to CU-Boulder with, he was going back for his Ph.D. in my same program with the thought he would go to West Point and teach. A position opened up at West Point in mechanical (engineering) and the daily phone calls started from him trying to get me to apply. I think finally just to shut him up I applied. For the first year it was quite an experience getting used to that sub-culture of the military. There were no other women civilians like myself in my program and in the whole academy there were probably about 10 of us. I loved West Point and did a lot of things in those five years but there was not a clear career progression there for a civilian. I was growing frustrated with issues around women there and started thinking if I leave this position, I want to get a position where I can make a difference when it comes to gender issues in engineering and education. The Kate Gleason Endowed Chair position came open here and I decided to apply. My focus was I would teach, do research in thermodynamics and also start looking at opportunities for gender-focused activities. In April 2004, we offered Park and Ride, an outreach experience for middle-school girls. After Park and Ride that summer we started summer camp. Then other colleges started looking at what we were doing. Over the last 10 years, there’s been more and more women in computing and science and technology who have become leaders in their own colleges around gender issues. Those women and I started working together on (grant) proposals. So much of what I do is driven by students and remembering what it was like for me as a student. I think it’s really very important for our women and our male students to have women role models in the classroom and to have a university where women want to stay and where they thrive. We are all kind of change agents and trying to facilitate change and make it happen as effortlessly and painlessly as possible. But we all know change isn’t like that. Sometimes when things are hard we have to step back and say this is good that it is hard. It means people are changing. Assistant professor, Department of Civil and Mechanical Engineering, United States Military Academy, West Point, N.Y.
Gender-based, average salary gaps existed at each faculty rank, and women left the faculty ranks at a rate nearly twice that of their male colleagues. Retention rates for female faculty that closely mirror those of male faculty.